This is a special Kinsmen project in tribute to our Canadian Forces in Afghanistan. For those who find it difficult to understand why I support our troops, this video sums up all I feel and more. Thank you, Dave Sopha. The Portraits of Honour National Tour will provide Canadians from coast to coast with an opportunity to honour and celebrate our Canadian soldiers, pay respect to those who’ve made the ultimate sacrifice and to recognize the challenges that face those who will return home with lasting physical or emotional injuries. Another suicide attributed to Mefloquine. Will someone please listen? 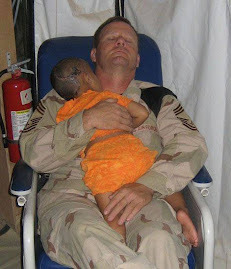 American John Gebhardt made a difference in this little girl's life. When Iraq insurgents murdered her family and shot her in the head, John was the only one who could comfort her in the hospital. Eventually she healed. He is her hero of peace. Every person can make a difference in the life of someone even if it is only one little girl. Between Trenton, where our fallen soldiers return home, and Toronto, there are 50 bridges crossing the highway--all have police officers, paramedics, firemen and ordinary folks (many wearing red T-shirts and waving the Canadian flag) saluting their heroes. And then from the Don Valley Parkway through downtown Toronto streets leading to the coronor's office, the sections used to carry our soldiers' final journey home have been designated the "Route of Heroes." 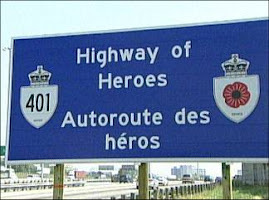 Signs are posted along the way to mark the completion of our tribute to the Canadian Force's sacrifices this century. For nine long embattled years, we have suffered a disproportionate number of casualties for the limited troops we continually rotate to combat the Taliban in one of the fiercest fighting areas of Afghanistan. 157 Canadian military personnel have fallen in Afghanistan during nine years of fighting. Between 2002 and 2011, Canadian casualties have climbed as we've rotated divisions of the same 2,500-3,000 Canadian troops to serve in the Taliban-inflicted area near Kandahar. Some troopers are on their fourth rotation of six-month duty per mission. Most deaths have been due to roadside bombs. 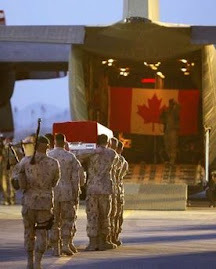 In addition to troops lost is one Canadian diplomat and one Canadian journalist. To date, total American military deaths over the same period: 1,438 and climbing fast. 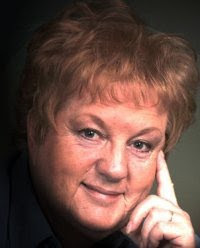 "This award 'acknowledges the values that every Blogger displays in their effort to transmit cultural, ethical, literary, and personal values with each message they write.' Awards like this have been created with the intention of promoting community among Bloggers. It's a way to show appreciation and gratitude for work that adds value to the Web. 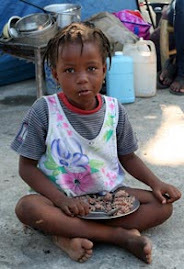 Click the photo to donate or phone in donations to 1-800-387-1418 or text HAITI to 30333.